The hard work of our teachers and S6 students paid off in the end. The HKDSE Exam results of our students were pleasing in general. 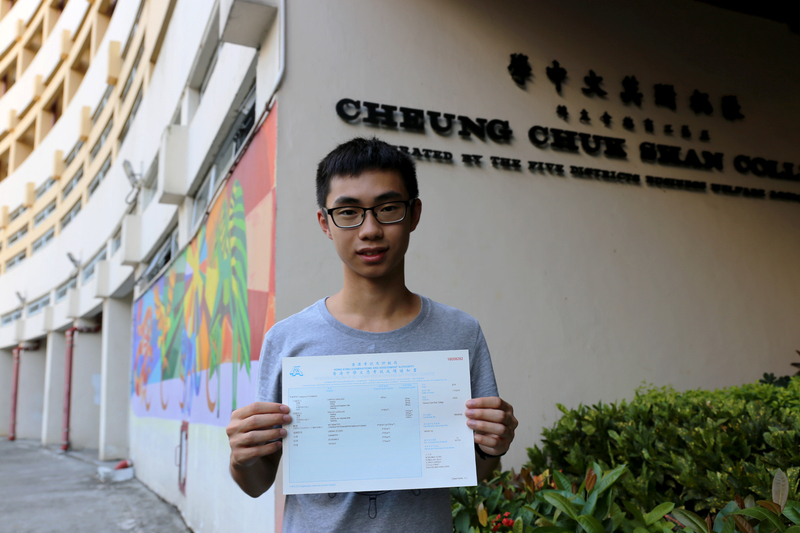 Each student on average has gained 2.83 L5s or above while the top student, Wong Man Yeung (pictured below), got 7 L5** (including Maths Extended Module II) and 1 L4. Congratulations to their success and hope our students can be admitted to their favourite tertiary programmes! Our swimming team was invited to participate in the invitation relay held at Victoria Park Swimming Pool and captured second in both Boys and Girls 4x50m Relay. 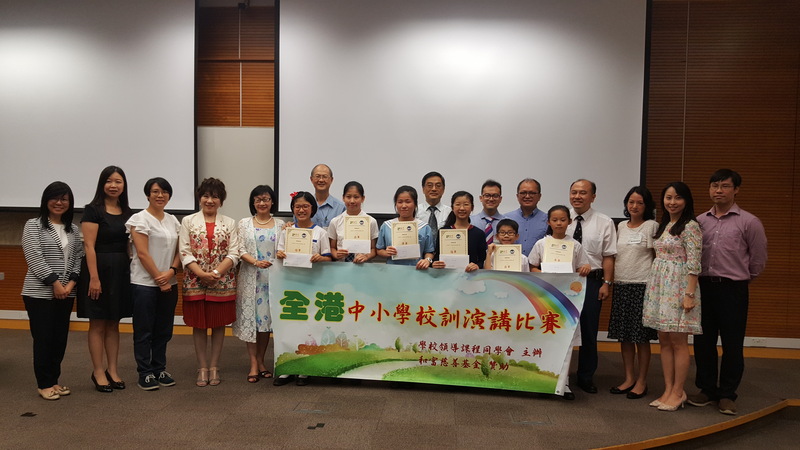 The 2nd SLA Speech Contest was held in the Hong Kong Baptist University on 3 July 2018. The title of the speech is “Our School Motto”. Our student, Chan Yan Yu of 2D, got the championship. Our congratulations! Five S5 Biology students joined this scheme organized by the Ecology & Biodiversity Department of HKU. 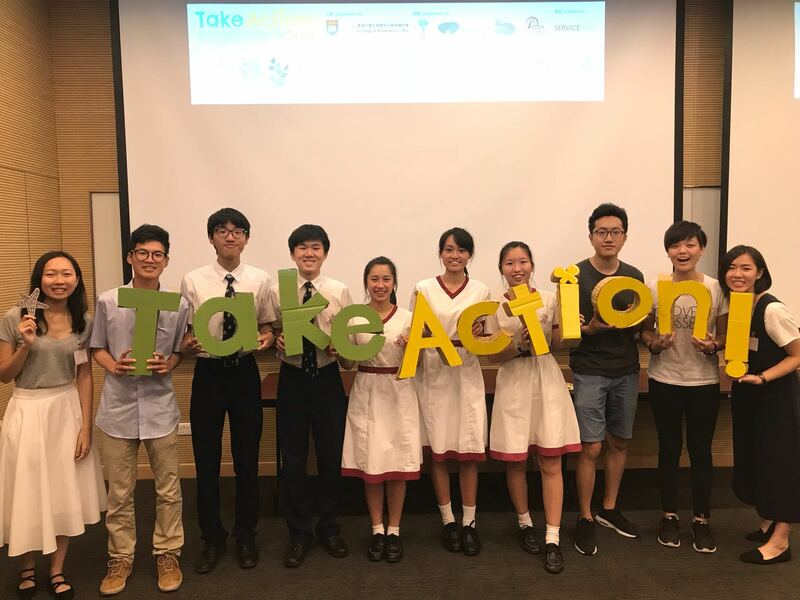 The objectives of the scheme were: (1) to raise the participants’ awareness towards conservation in Hong Kong, (2) to introduce the various ecological habitats to them, and (3) to provide them with hands on experience in organising environmental education programs. We are glad to know that our team won the Outstanding Take Action! Leaders Award. In December 2017, two of our students, 4A Chan Ka Tsung and 4D Hui Shau Yip were selected after an interview to join the Jockey Club (JC) Youth Football Leadership Scheme organized by HKJC, Manchester United Soccer Schools (MUSS) and Tung Wah Group of Hospitals. The scheme provided quality football training and also leadership programs to the young participants. Training sessions were led by chief coach Mr. Chris O’Brien of MUSS. The participants had opportunities to attend lessons taught by different star teachers, like Sammy Leung森美, Cecilia Yeung楊文蔚, Ada Tsang曾燕紅, Rex Tso曹星如 and Herman Yau邱禮濤. Under the supervision of the coaches and teachers, they had the opportunity to try out what they had learnt through organizing football coaching services to primary school children. On the graduation day on 2 June 2018, Chan Ka Tsung was one of the six chosen for their outstanding performance in the training programs to attend football training in Manchester, UK during the coming summer. Congratulations! Finally, a special thank should be given to Mr. Leung Ka Man, the football team manager, for his support and guidance for them. 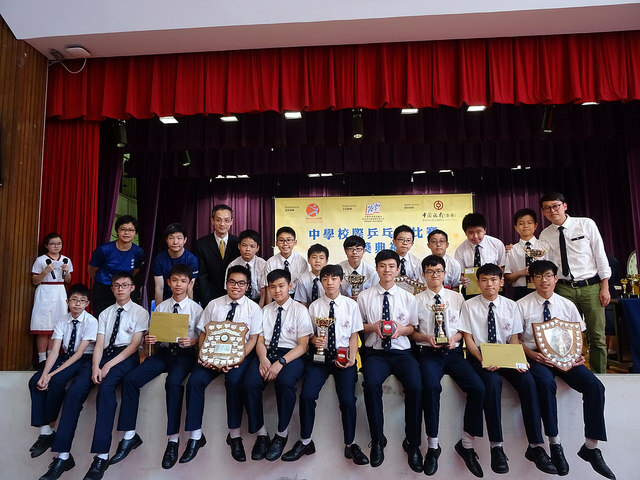 A team of seven S5 students was awarded the first runner-up in Problem 3 division III in the Hong Kong Regional Tournament. 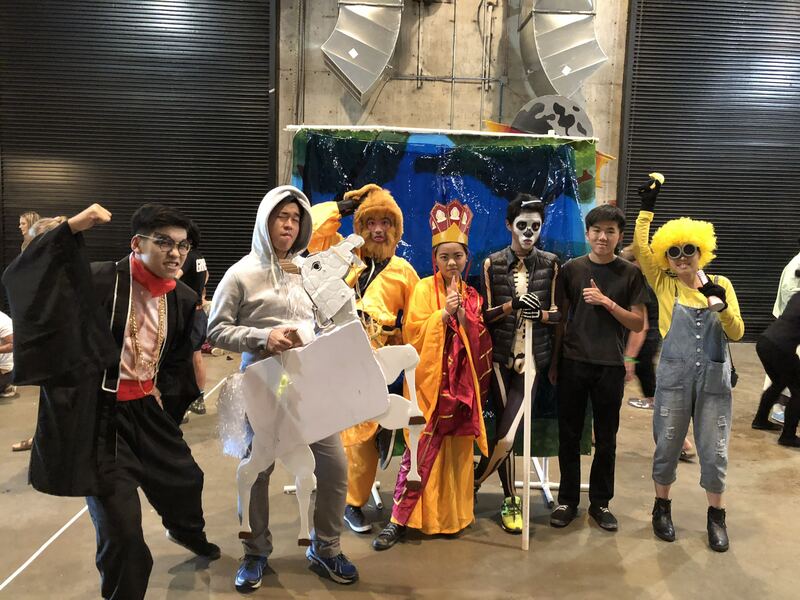 They represented Hong Kong in the Odyssey of the Mind World Finals in May 2018. During the event, our team met other competitors from different countries of the world, gaining plenty of inspiring experiences. Most importantly, we learned about problem solving and cooperation. 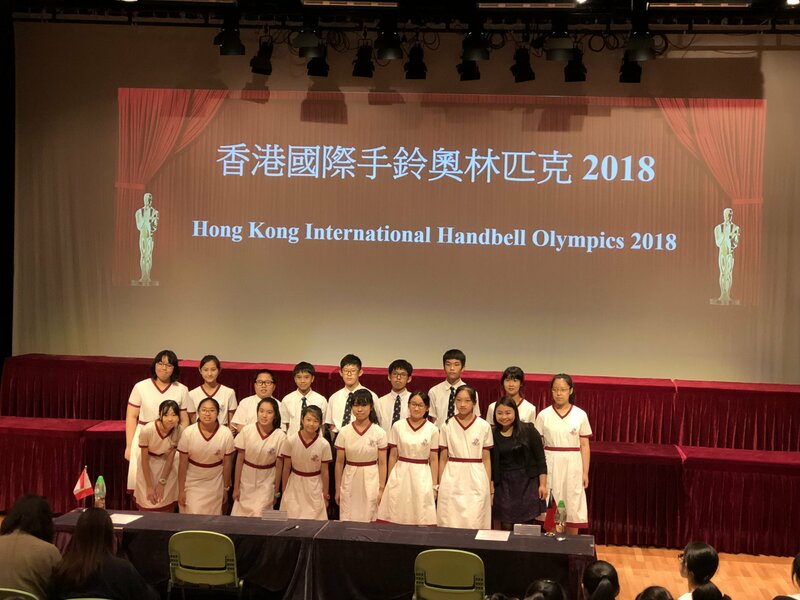 The Handbell Team took part in the Hong Kong International Handbell Olympics 2018 and won the Silver Award (Intermediate Section). The team members have been working hard in their weekly rehearsals. They performed two well-known music pieces, Carrying You of the Castle in the Sky and Jubilance, at the competition. Their performance was highly commended by the judges. Three of the team members were then invited to join the masterclass under the baton of Mr. Stuart Sladden, a famous Canadian Handbell teacher, and had a joint-school performance with other school counterparts in the evening. Our school has participated in this event since its introduction in 2009. As the keenness among competitors has been increasing through these years and new records were created every year, our indoor rowing team was formed in 2013-14 to provide formal training to students. This year, 47 schools participated in Boys events and 44 in Girls. However, the first-day events were all cancelled due to the bomb issue in a Wan Chai construction site. Only 2000m and 4x500m relay could be finished on the second day. The efforts and contribution of all team members and our coach, Ms Ho Wai Chi Ceci, are highly appreciated. 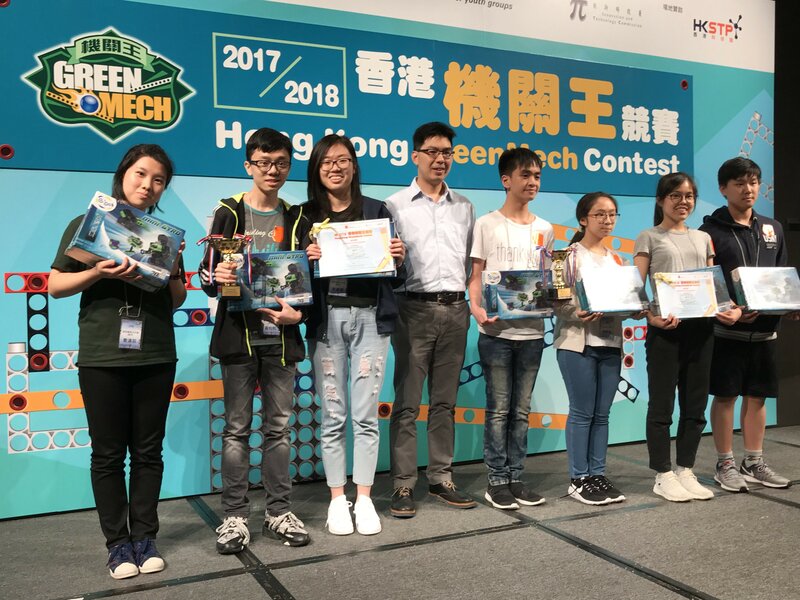 Our 5B students, Tsoi Ka Wai, Qiao Qingchen and Wong Pak Hei were awarded Honorable Mentions in the Senior Secondary Division of 2017/18 Hong Kong Green Mech Contest in recognition of their innovative talents and enthusiastic efforts in the competition. Our congratulations to their achievement! Boys Division 2 inter-school table tennis competition has finally come to an end on 18 March. On that day, C Grade boys’ team captured the championship. Together with B Grade’s championship and A Grade’s second prize, our boys’ team captured the overall championship in Division 2. They will be promoted to Division 1 next year! Congratulations to all team members! We have the honor to host the prize presentation in our school hall on 2 May. Team captains received the medals and trophies from our principal Mr. Au, guest of honor of the ceremony. We wish to extend our appreciation to team members, our coach Mr. Chung Pak Kei and team manager Mr. Leung Ka Man for their efforts and contribution. “Community Connect – STEM Challenge” was organized by MTR and students taking part in the programme learned how STEM disciplines are applied in daily life. The finale of the programme saw 14 shortlisted teams from different schools presenting their projects on the Pitch Day held on 28 April 2018. A group of our S4 students presented their project “LOHAS BRIDGE” and was awarded the “Most Innovative Project”. Our congratulations! Students participated in this music contest and they got pleasing results. Among all, Chan Cheung On Joseph of S2B won the championship in his Erhu Solo (Senior) entry. Lin Nga Yi Angela of S4B, Wong Yun Fai Samuel of S3A and So Chiu Tat Jerry of S2A won the first runner-ups in Zheng Solo (Senior) entry, Piano Solo (Grade 8) entry and Erhu Solo (Intermediate) entry respectively. Ng Hou Yin Matthew of S2A and Lo Sze Wai of S1B came third in Dizi Solo (Senior) entry and Trumpet Solo (Junior) entry respectively. Our sincere congratulations to all the prize winners.